At Jarrett Bay, not only do you have the opportunity to build your truly custom interpretation of the perfect boat, we offer two programs to ensure that our pricing is the most competitive you’ll find. Build a completely custom sportfish with us, selecting everything from scratch, including the length, propulsion, equipment, layout and décor, and you’ll get exactly what you pay for. No compromises. More and more of our customers are choosing another route. After assessing your needs, we’ll recommend a hull length, layout and engines based upon a boat we’ve previously built, and provide you with a contract price complete with a list of specifications and renderings. This gives you the ride, performance, custom-crafted cold-molded construction, resale value and flair that are the pride of all Jarrett Bay owners. The difference lies in knowing the final cost upfront. If you elect to make changes to the process along the way, we will simply add the individual changes to an order sheet, along with a price that will be agreed upon prior to the change. Few other custom builders can provide you with a contract price and the inherent peace of mind it brings. Another benefit of this program is that it relieves you of the hundreds of decisions required when building a boat from the keel up. Of course your input is always welcomed, and we will incorporate changes or modifications that you desire – pricing them upfront. This allows you to manage both your cash-flow and the end result. Of course, when we work together this way, the absolute final pricing cannot be determined until the boat is complete. Individual features can be so unique that we can’t responsibly quote a price until we’ve built them. 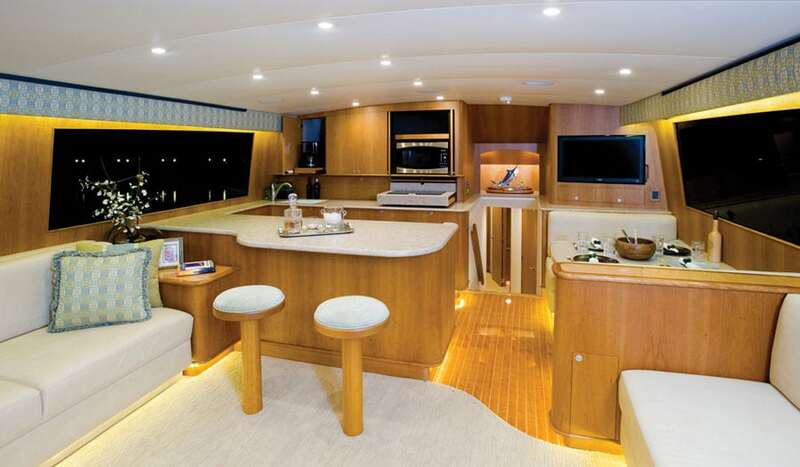 Examples include a liquor cabinet with racks sized to fit specific brand bottles, tackle drawer trays sized to fit specific lures, or a boat we built with two galleys – one equipped for entertaining and the other tailored for prepping meals. 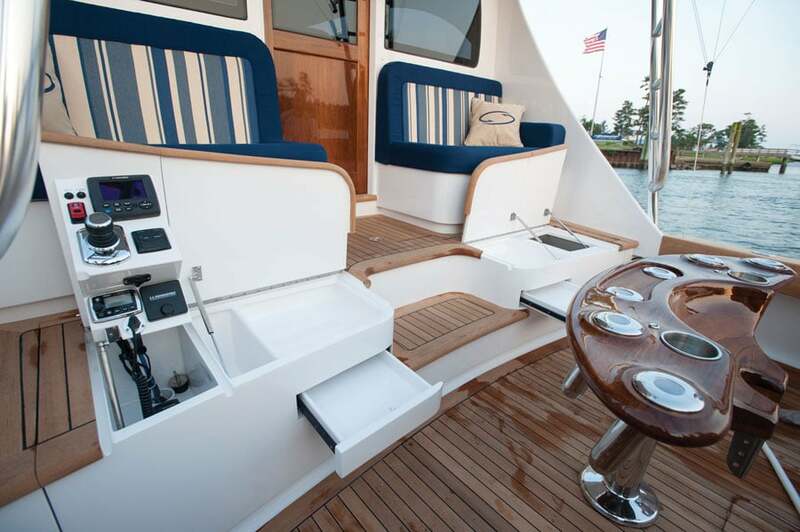 With a completely custom Jarrett Bay, we build on a cost-plus basis – your boat will be exactly as you ordered, and you will get exactly what you pay for. Jarrett Bay can offer contract pricing for a variety of reasons. For one thing, we’ve been in business a long time, built many fine yachts, and kept meticulous records. Besides building boats, we are also a full-service boat yard and refit center, servicing not just our own boats, but also those of almost every manufacturer imaginable. That means we are on top of the man-hours and materials costs for a myriad of jobs and services. What little isn’t actually performed in-house by us, is usually completed on-site by one of the many vendors and service companies found in our marine industrial park. For these reasons, no other custom builder can offer the integrity of Jarrett Bay’s pricing programs, and no production builder can match our performance or pride of ownership and distinction. So choose to build your Jarrett Bay the traditional way, cost-plus, or sit with our team to see if your dream can be built with a contract price. Either way, you’ll find the price extremely competitive. And that’s before you factor in the efficiency of running a highly-evolved hullform that’s traditionally 30-percent lighter than mass-produced models.